The new application note, prepared by our application specialist Toon Coenen, focuses on the methylammonium lead halide perovskite materials. In our previous application note we already described exceptional performance of perovskite materials in solar cells, light-emitting diodes and lasers. While most of the time perovskites are grown in a more traditional shape of thin-films and nanocrystals, it was discovered recently that with the use of carbonate salts perovskite materials can take a large variety of complex 3D shapes. 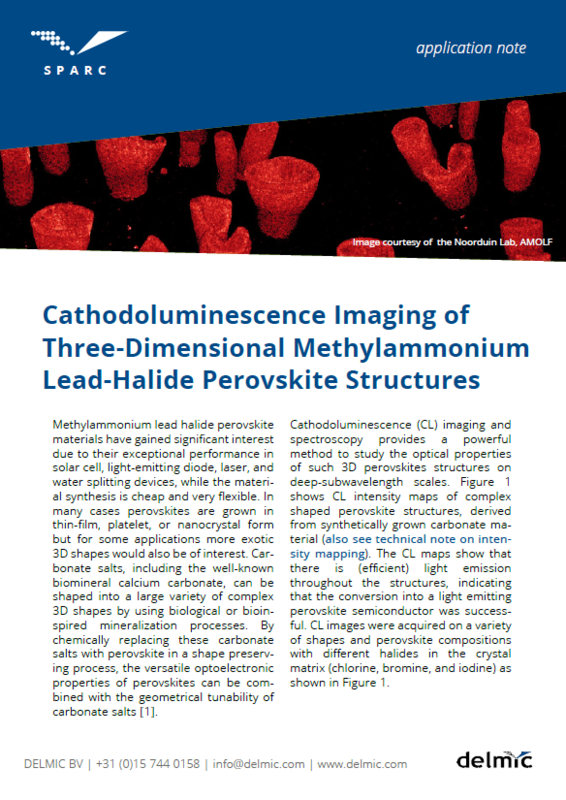 Cathodoluminescence (CL) imaging is a powerful method to study the optical properties of such structures on a deep-subwavelength scales. The intensity maps, acquired with the SPARC cathodoluminescence detector, show (efficient) light emission throughout these perovskites structures. If you would like to know more about this research, we invite you to download the application note below. If you are interested in cathodoluminescence imaging applied in various scientific fields (nanophotonics, geology, materials science) explore our resource library.